'The performances are agile, airborne, refreshingly unpredictable and alive with exhilarating freedom'. 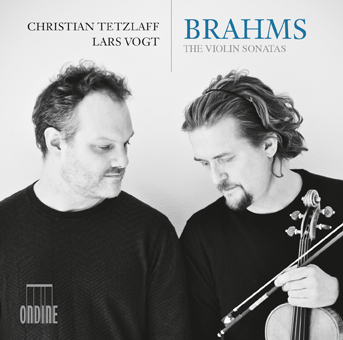 Award-winning violinist Christian Tetzlaff together with pianist Lars Vogt offer an exciting program of Violin Sonatas by Johannes Brahms (1833–1897). This new release continues a successful series of recordings of violin chamber works by the artist duo. Johannes Brahms’ Violin Sonatas are among the greatest masterpieces in 19th century chamber music. Brahms wrote these sonatas between 1878 and 1888, at the height of his creative powers. With these powerful works Brahms brought the genre of violin sonatas into a new dimension. Included is also Scherzo movement from the F. A. E. Sonata which Brahms contributed to a composite sonata with Robert Schumann and Albert Dietrich in 1853. Christian Tetzlaff is considered one of the world’s leading international violinists and maintains a most extensive performing schedule. Musical America named him ‘Instrumentalist of the Year’ in 2005 and his recording of the violin concertos by Mendelssohn and Schumann, released on Ondine in 2011 (ODE 1195-2), received the ‘Preis der deutschen Schallplattenkritik’. Gramophone Magazine was choosing the recording of the Schumann Violin Sonatas with Lars Vogt (ODE 1205-2) as ‘Disc of the Month’ in January 2014. In addition, in 2015 ICMA awarded Christian Tetzlaff as the ‘Artist of the Year’. His most recent recording on Ondine with Brahms’ Trios (ODE 1271-2D) received a GRAMMY nomination. Lars Vogt was appointed the first ever “Pianist in Residence” by the Berlin Philharmonic in 2003/04 and enjoys a high profile as a soloist and chamber musician. His debut solo recording on Ondine with Bach’s Goldberg Variations (ODE 1273-2) was released in August 2015 and has been a major critical success. The album’s tracks have also been streamed online over 5 million times.